Sports venue AV is moving from an evolutionary pace to one in which venues virtually leapfrog each others’ new wrinkles. Digital audio gives way to networked sound while HD video is overtaken by HDR. The Los Angeles Angels’ Angel Stadium renovation, completed ahead of this MLB season, offers a look into the process. 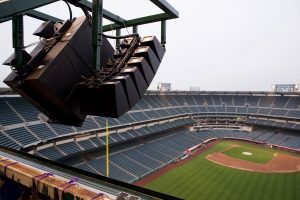 AV systems integrator Diversified, which has an extensive sports-venue portfolio and earlier had completed the renovation of the Phillies new Citizens Bank Park and Colorado State University’s new Multi-Purpose Stadium in Ft. Collins, seems to be finding a new angle with every venue project. Angel Stadium, for instance, now has a permanently installed field-level sound system to play music during pregame practices and warmups, something they’ve also recently done for the Cubs and the Dolphins, reflecting an emerging trend. Angel Stadium also reflects another ongoing trend: music touring-grade sound systems installed as venue PAs. The venue now has a 200,000-watt d&b Audiotechnik and Nexo SA speaker system through 300 speakers and 50 subwoofers. A Yamaha CL3 mixing console and QSC QSYS processors provide control for the system that, except for the announcer’s mic, is entirely digital. Two amplifier rooms with power, HVAC, and fiber connections were added to shorten wire lengths for improved performance to the extended seating sections. The venue’s video is equally to scale — what had been 7,474 sq. ft. of screenage over 8 displays of 23-mm pixel-density, 6,000-Nit brightness LED video of is now 23,876 sq. ft. over 13 displays of 13-mm pixel density LED capable of 11,000 Nits. A production control room upgrade includes a new technical core with infrastructure, replacing the SD terminal equipment with a true, HD 1080i production core featuring Evertz core routing, display processing, and terminal gear. A Ross Acuity/Vision production switcher controls the content with graphics provided by Daktronics DMP and Ross Xpression engines through a Christie X-80 Spyder processor with redundancy. A 12-Channel EVS XT4 slow motion server provides replays. Four Ikegami HDK-97A HD camera chains coupled to Canon Broadcast lenses, two with WaveCentral “paint” control, capture action and fans. To top it all off, the iconic roadside “Big A” Marquee also experienced a complete full-color LED halo renovation. However, as scale increases, the implications of each move forward become potentially more consequential. With such large video, for instance, integrating bigger sound to match meant strategically positioning speakers so as to not obstruct sightlines, particularly those of the low upper balcony. To significantly reduce the visual footprint and overcome the clearance issue, slim profile, high-output Nexo speakers were clustered in specialized cabinets and installed using custom-fabricated mounts just under the ribbon boards. To properly position speakers across the field, structural steel was added to the scoreboards for a unique line-array installation solution. Interestingly, technical advances affecting live sound, such as networking standards and protocols, from Dante to AES67 to the recently unveiledAVB collaborative Milan, have gotten audio to a new plateau, while advanced video standards, such as SMPTE ST 2084 for HLG and PQ HDR continue in an evolutionary process built around Rec. 2020 and the newer Rec. 2100 color spaces. (Although AVIXA has another new audio standard, addressing spectral balance of sound systems, currently under review.) A number of installations are ready for HDR but are now being used with HD/1080p content as they await a more unified and consistent adoption by manufacturers, he explains.